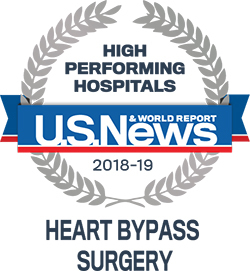 Top-ranked surgeons at the Center for Advanced Cardiac Surgery perform some of the region’s most state-of-the-art cardiac surgeries available, offering high-quality, advanced treatment options ranging from complex cardiac surgeries to minimally invasive procedures to robotic-assisted procedures. Each surgical procedure is tailored to the individual patient with a specially trained cardiac surgery team working together to provide comprehensive care before, during, and after surgery. Read the latest news articles about the Steward Center for Advanced Cardiac Surgery. Learn about our advancements, and get to know our doctors and their achievements. Many patients who come to the Steward Center for Advanced Cardiac Surgery have a story to share about their care, recovery, and success after surgery or other treatments. Transcatheter Aortic Replacement The aortic valve is located between the pumping chamber on the left side of the heart and the aorta, which is a major artery. About Bypass Surgery A coronary artery bypass graft (CABG) is a surgical procedure that restores blood flow to the heart muscle.